YES, the meaning of words is becoming degraded. I suppose that when a national newspaper (owned I believe by Conrad Black) calls for the murder of a foreign head of state it can indeed be called "a strong editorial stand." Particularly at a time when the world is mourning the assassination of the (incidentally, pro-Palestinian) Swedish foreign minister Anna Lindh the day before. In normal times such a call would be open to prosecution as criminal incitement; when Jewish terrorists murdered Britain's top Cabinet minister in the Middle East in 1944, they were hanged for it. But these are not normal times, and different rules apparently apply to different countries. I do not recall Saddam Hussein or Slobodan Milosevic ever having called, in a "strong editorial," for the murder of either of the Bush presidents, let alone of their trigger-happy associates. I wonder if Mr Black (above) and his willing-to-wound-but-afraid - to-strike pals ever consider that their calls for blood may provoke an increased anti-Semitism in normal folks around the world, and that what went around may yet come around again, as sure as H follows G? I recall that part of the justification offered by Dr Joseph Goebbels in his 1942 diary for murdering several hundred Berlin Jews was that the more of these that were done away with, the safer he felt: "I don't want some Ostjude one day pumping bullets into my belly," he wrote, or words to that effect. Some of us decent people yearn for a return to the courtesies of the 1930s, when no foreign governments publicly called for, let alone instigated, the assassination of foreign statesmen because of their policies (or religion). Meanwhile, I assume that no life insurance company will be keen to sign up a policy for the beleaguered President Arafat. THE Jerusalem Post took a strong editorial stand today, calling on Israel to kill Yasser Arafat: "The world will not help us; we must help ourselves. We must kill as many of the Hamas and Islamic Jihad leaders as possible, as quickly as possible, while minimizing collateral damage, but not letting that damage stop us. 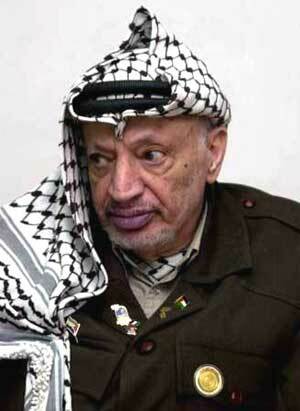 And we must kill Yasser Arafat, because the world leaves us no alternative." The Post writes that Arafat prevented Abbas from combating terrorism, and "the new prime minister, Ahmed Qurei, clearly will fare no better, since he, if anything, has been trying to garner more power for Arafat, not less." The paper then explains why expelling Arafat would not work: "he will be as much or more of a problem when free to travel the world than he is locked up in Ramallah," especially in light of the fact that the U.S., Germany and France will not boycott him. "When the breaking point arrives," the paper concludes, "there is no point in taking half-measures. If we are going to be condemned in any case, we might as well do it right. Arafat's death at Israel's hands would not radicalize Arab opposition to Israel; just the opposite... Arafat does not just stand for terror, he stands for the refusal to make peace with Israel under any circumstances and within any borders. In this respect, there is no distinction, beyond the tactical, between him and Hamas."